The Association has embarked upon a project to develop a database of the soldiers and officers who served in the Leinster Regiment throughout its incorporation from the 100th & 109th Regiments of Foot to the time that the Regiment was disbanded as a Regiment of the Line in 1922. This mammoth project is being coordinated by Don Dickson with the help of the Association's members and historians. When completed the results will be published online in our free to view database. There are a number of documented original sources held at the National Archives in Kew, London, including very rare copies of the Regiments Pay & Muster Rolls of the 19th century. For records of the very late 19th century and early 20th century the task is much more difficult because of the loss by fire of official War Department (now Ministry of Defence) personnel records during WW2. There remain some sources, such as the Medal Records Index for WW1 medal awards to soldiers who served in "conflict" areas, and a few surviving personnel documents, however of the vast majority of men who served in the Regiment there are no official records. The Association's team are therefore collecting information through a number of means. Pay and Muster Lists: These are held at the National Archives in Kew, London. They are very old original handwritten manuscript books originally kept by the Battalion or unit Paymaster and regularly returned to the War Office. These books are too fragile to be scanned and volunteers are photographing the pages in these books, then slowly transcribing each entry into a worksheet (spreadsheet) for subsequent incorporation into a database. 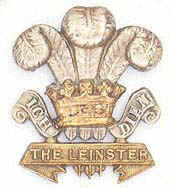 Personal Information: There are many descendents of Leinster Regiment soldiers alive today who retain information about their ancestors. Many soldiers who retired from or left the Regiment went on to live full lives and we believe that their families remain proud of the contribution their ancestors made through service in the Leinster Regiment. Drawing on the information collected by the coordinators personal web site, we are now collating a huge backlog of information for incorporation into the database. Personal family records or documents are a very valuable source of information and any person who had a former relative that served in the Regiment is encouraged to contact us. Medal Rolls: There are a number of medal rolls that are archived at the National Archives in Kew London and these include the WW1 Medal Index Cards (MICs) that were created by the Army Medal Office towards the end of the First World War. The cards record an individual's medal entitlement, their rank, their Regiment, sometimes their battalion and often the first theatre of war in which they served. To read more about and search the archive on WW1 Medals click here (opens in a new window) If you have a subscription to Ancestry then you can search and view MICs as part of your subscription. Soldiers who were serving in the Regiment during the Boar War will have received the Queens South Africa and Kings South Africa Medals unless they remained on Home Service. The detail of those records are kept on Microfilm at the National Archives. There are no current government plans to digitise the Boar War Medal records so volunteers are photographing the pages in these books, then slowly transcribing each entry into a worksheet (spreadsheet) for subsequent incorporation into a database. Would you like to help our project, maybe you have some information that you can donate to the project, or maybe you would like to volunteer to transcribe the soldiers data from photographs of the records into our database? If you think you can help click this link interested in helping the project?